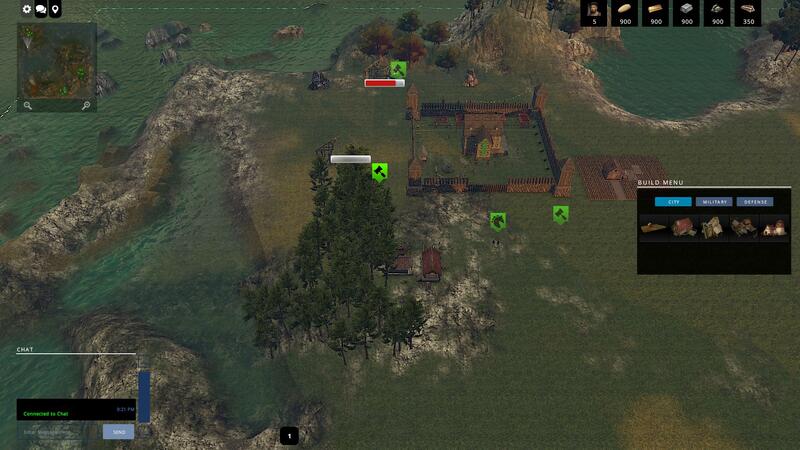 Avalon Lords: Dawn Rises is a true RTS game being developed by Animus Interactive Inc. The Steam community voted to give the game a go through Steam’s Greenlight program back in 2014 and it is now available for Early Access. 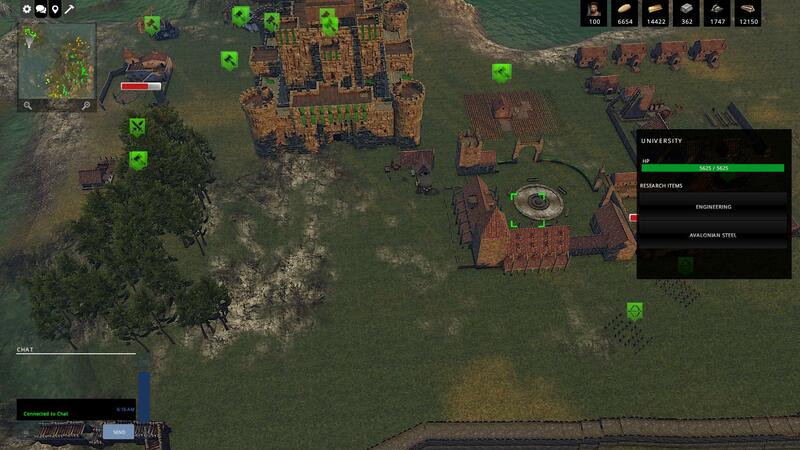 It features free-form city building, real-time combat between units, and a variety of game modes to play in. If you ever enjoyed the “Age of” games, such as Age of Mythology, you will be familiar with some of the gameplay elements. Today we get to take an Early Look at the game and see how far along it has come. Age of Mythology, one of my all-time favorite games, is pretty similar in terms of gameplay. You build buildings, gather resources, build more advanced buildings, stock up on military units, then attack and defend while trying to maintain your base and destroying the enemy base. I love that this style of gameplay, in a fantasy setting, is still being done today as it is honestly my favorite way to play strategy games. A more recent title which is kinda similar, though faster paced, would be Starcraft II. This is the type of game where you have to enjoy multitasking, because there’s a decent chance you’ll have multiple battles going on and have to maintain your base and support NPCs all at the same time. For the most part, the building system in the game is great. The concept, anyways. The game is still in early development, though playable, so there are some bugs. I want to stress, though, that bugs are to be expected in this stage of development. 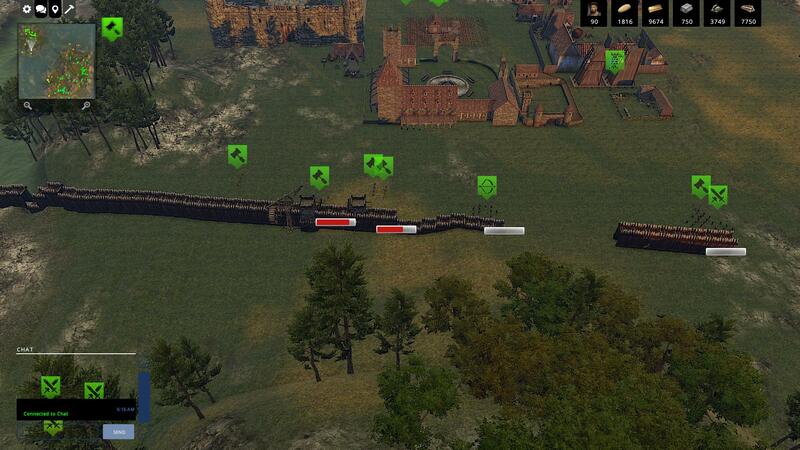 For example, building walls can be a bit annoying in the current iteration of the game. They are an awesome feature, though. You have free reign over your design with them. It’s a drag-and-click system, so if you wanted to you could create a walled-in fortress in the shape of a star. Or if you really wanted to (and have the sadistic capacity for it) you could build a Death Maze to funnel enemy troops into bottlenecks. There is a bare-bones technology system in the current version of the game. This is accessed by constructing the University, though there are also a few basic tech upgrades you can do without it. The UI really needs more fleshing out for the technology system, though, as right now it’s confusing and something you can easily miss if you don’t read about it ahead of time. I’m not completely sure, but I’m guessing that the end game won’t have that advanced of a technology system either. Just a simple “Build certain structures, click, and wait.” system. Resource gathering is done by constructing certain buildings and then assigning your Citizen/support units to work them. If you want wood, you need to build a Sawmill in some woods. If you want iron, build a mine on an iron mine. Same with the other minerals. Farms can be placed anywhere flat, for the most part, though. I’m not sure if it’ll be possible in the released version of the game, but currently you have to be careful in the first steps of a match to ensure you don’t run out of one of the starting resources before you can construct at least one of each basic resource gathering building. I made the mistake of using all my wood before I realized I needed a Sawmill in my first match. Don’t mind the UI. It’s not very functional yet, and I can’t wait until a real UI is implemented. Military units are pretty basic. If you want foot-based units, build a barracks. If you want more advanced foot units, upgrade your barracks and increase your technology. 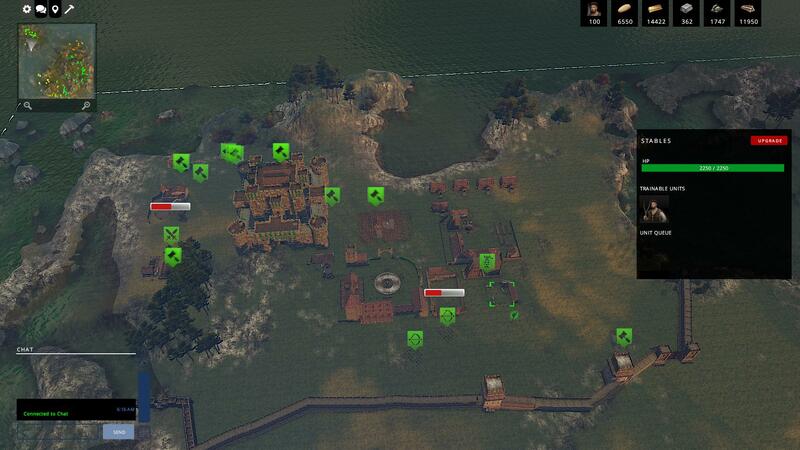 Stables for cavalry, siege workshop for siege weaponry, etc… Creating military units costs population, which is gained by building houses, and other resources depending on what type of unit it is. Like I said, it’s pretty basic but it also keeps things fun. That’s what I’m liking so much about this game so far; there’s a decent amount of things to manage, but they don’t go so in-depth that you have to stretch yourself to maintain them all. Since we just talked about military units, it makes sense to talk about the battle mechanics of the game, right? Well, right now, combat is pretty simplistic. I’m not sure how advanced it will be in the end, but so far as I’ve been able to tell the most advanced orders you can give units (for now) is to attack, run away, or sprint. Oh, and you can order a tight or loose formation. I imagine that more options will be made in the future, or so I hope, as I would love to be able to fine-tune the positioning of my units or give them orders to attack any hostiles that get within a certain range. 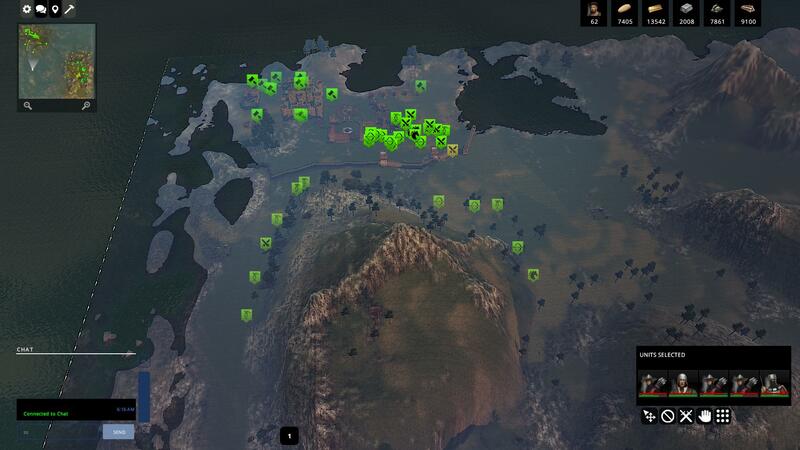 Battles can be pretty big already, and the system feels like a bare-bones version of what you would find in a Total War game. 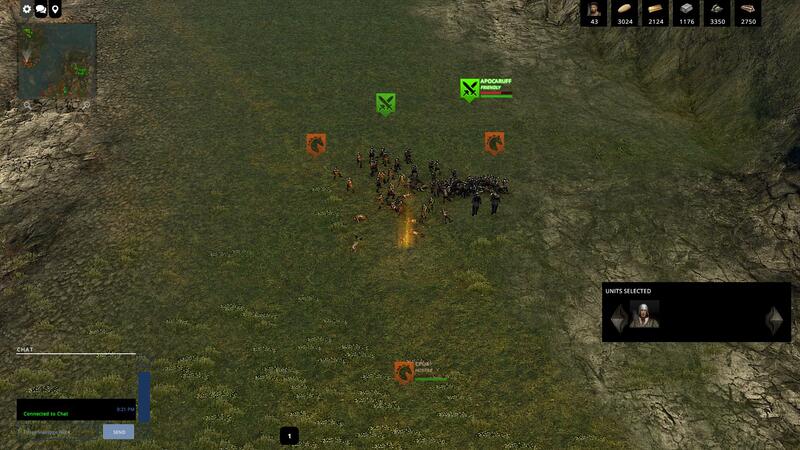 There really isn’t much to report on battle mechanics right now, unfortunately. 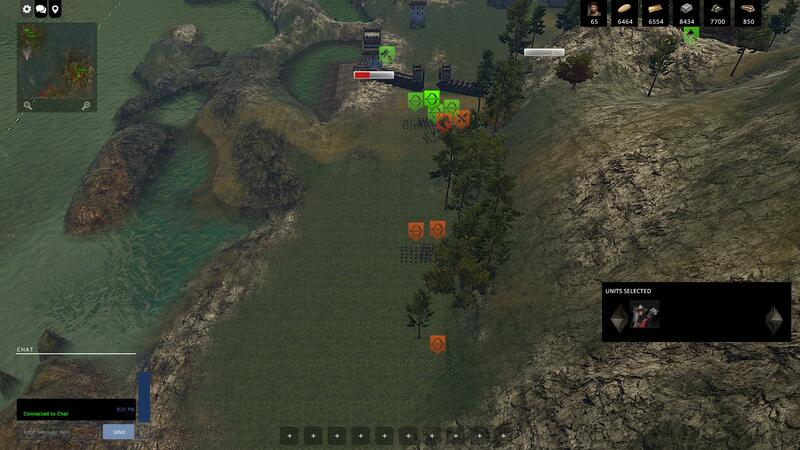 Right now, a typical match has you started in one corner of a fairly large map. 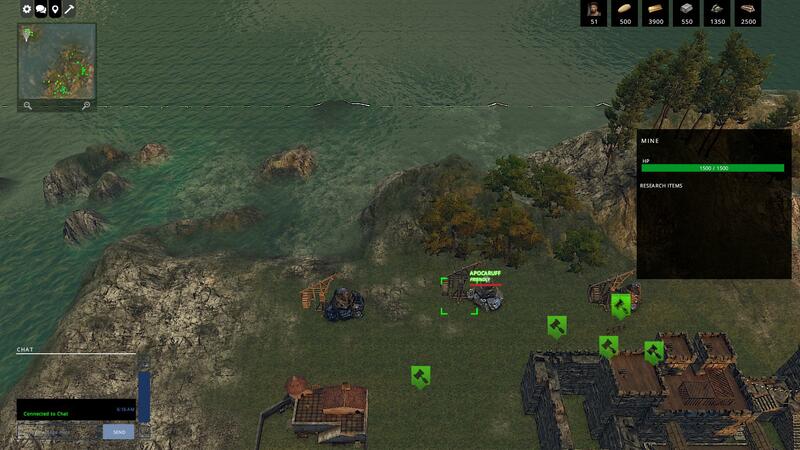 There are several “green” settlements around the map, which are your teammates. These are not so far that you’ll never be able to support each other, but far enough away that you will feel mostly isolated. If the match-making can manage it, you’ll play with other players. If not, the empty slots will be filled with CPU players. I’m not sure how popular the game will be from the get-go, but I feel like it’ll gain enough attention for a healthy population, so I’m not worried about finding players to play with. 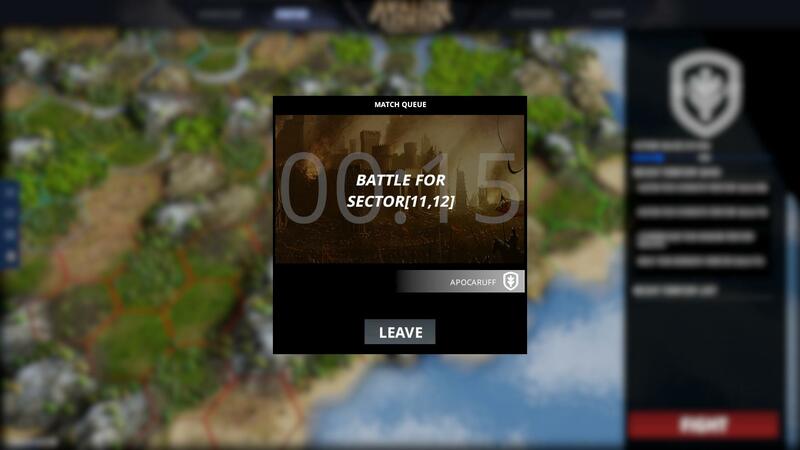 As the Match goes on, you’ll instruct your citizens to build important resource gaining buildings. Farms, mines, sawmills, those sorts of things. Then you’ll have them gain resources so you can upgrade your castle and other buildings, unlocking the potential for more citizens to be made and expanding your stronghold and its capabilities. Military structures will be made, a university can be constructed to research more advanced technologies that allow you the ability to build more advanced buildings. Pretty standard stuff, really. From there, you’ll continue to advance your settlement. Once you’ve got a pretty strong core, you will probably send out some units to explore the nearby area to see who your neighbors are, and how they’re coming along. If you see someone that’s a bit worse off than you, you may want to attack and try to take them out early. Or at least set them back enough that they won’t be so much of a threat. Matches can go on a long while, especially when you’re new to the game and haven’t yet figured out the ins-and-outs of everything. Of course, if you’re like me, you’ll end up quitting matches very early in the beginning (if you’re fighting CPUs, anyways) so that you can continue to refine your strategy at a more rapid pace. The game is in Early Access, so not all features are available and some are in but aren’t complete. The feature I’m most looking forward to seeing complete is “Empire Mode.” This is the persistent multiplayer mode where players will battle against one another for control of territories. Dunno about you guys, but that sounds fun as hell. 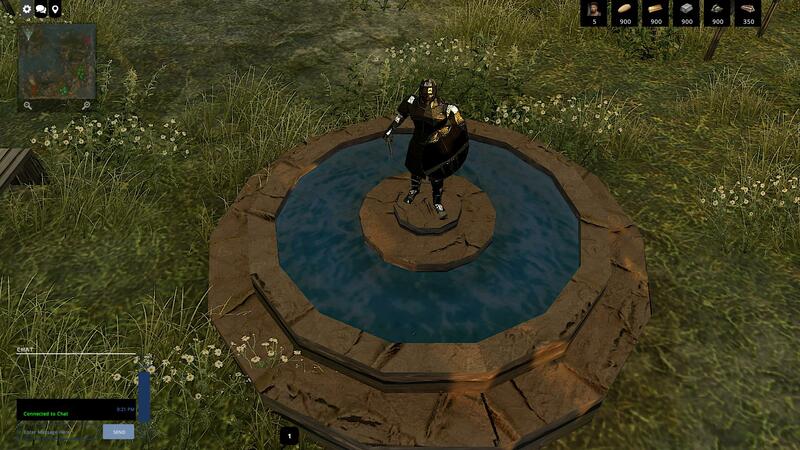 Right now it’s in the game, but it feels like more of a filler system. I can’t be sure, but there seems to be next to zero functionality. Something else I’m looking forward to is the Single Player Campaign. The backstory for the campaign (which can be found on the Steam store page) seems like it will be interesting. I imagine that there will be a series of missions where you will need to build a new settlement and a new army for each one. So far the game has been pretty similar to my old favorites, and that’s how it was done back then. I could be wrong, though. Hopefully we’ll get to see it soon. 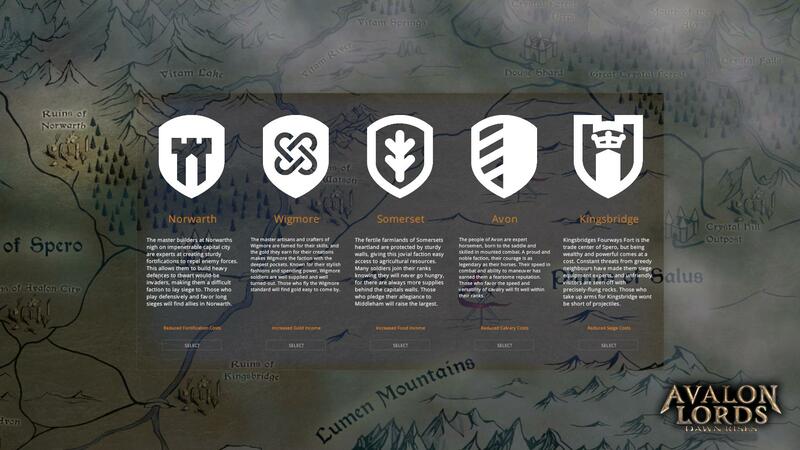 Avalon Lords: Dawn Rises is shaping up to be an awesome game. It reminds me a lot of my favorite games – Age of Mythology, even Kenshi – and some other popular titles, such as Starcraft. If the developers execute this right, they’ll have a very successful game on their hands. The gameplay is fun, re-playability is through the roof, and the future looks bright. 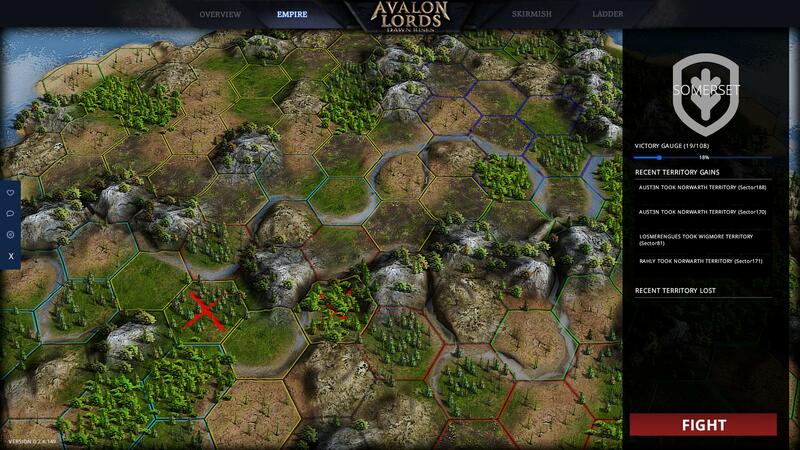 I would say go ahead and give Avalon Lords: Dawn Rises a look, maybe even a buy. I feel like you’ll certainly get your moneys’ worth.